Last night's wind storm kept volunteers busy on the south side of the town of Penfield. Most of the calls were for trees and power lines downs. Whitney Road became impassible by Brooktree and Baird Road was also impassible south of the railroad overpass due to the same conditions of fallen trees and power lines. Outages were scattered around town, a stop light at Willow Pond and 441 had to be re-secured by the State D.O.T. as the wind blew it down. The Rochester airport reported a 72 MPH wind gust at 8:23 PM. 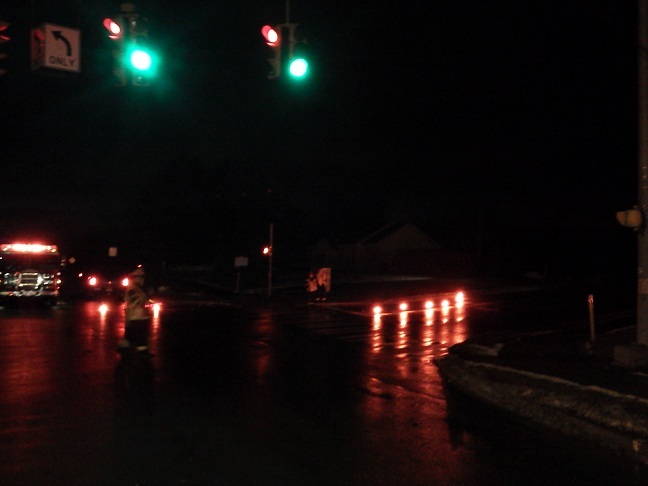 We'd like to remind the public that when there's a power outage to treat stop lights as a four way stop. We've seen to many unnecessary crashes because drivers simple blew through intersection because the light was not functioning. Also when coming upon a road block to set up by the fire department please obey the Firefighter and or Fire Police Peace Officer as they are trying to safely help the public and keep traffic moving so you can get to your destination. We understand that sometimes your home is located past the road block. In this case try to get a hold of the Firefighter and or Fire Police Peace Officer and let them know where you are trying to go. They maybe able to help you or give instructions on how to get you to your destination. On a more humorous note - As 11:00 PM rolled around and the winds where still screaming and traffic had just started to quiet down when an older Buick pulled up to a closed intersection. The firefighter leaned over to ask the 80 year old woman what a lovely lady like herself was doing out on a night like this... She replied she was singing Karaoke with her friends as a local restaurant and was trying to make her way home..... Not quite sure how to respond the firefighter waved her on her way.